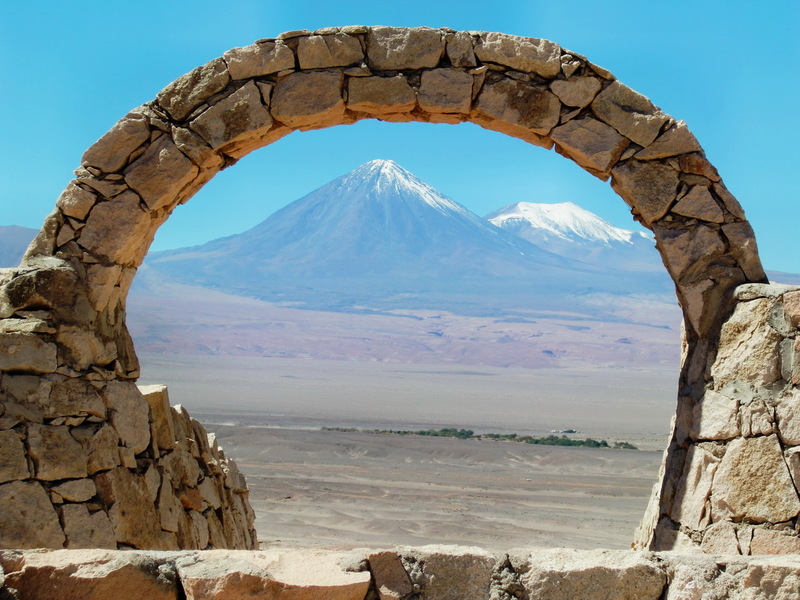 San Pedro de Atacama is the archaeological capital of Chile. 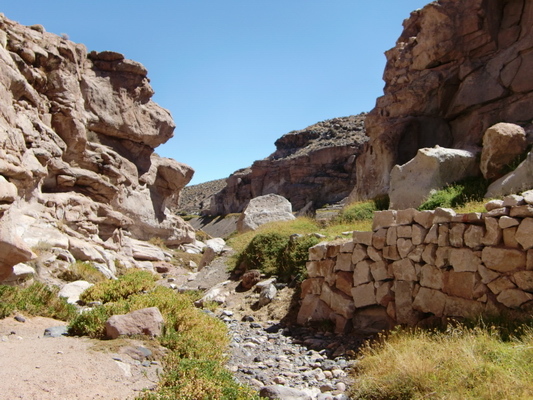 A lot of ancient villages and sites like Pukara de Quitor are closed to San Pedro. There is also a very nice archaeological museum. 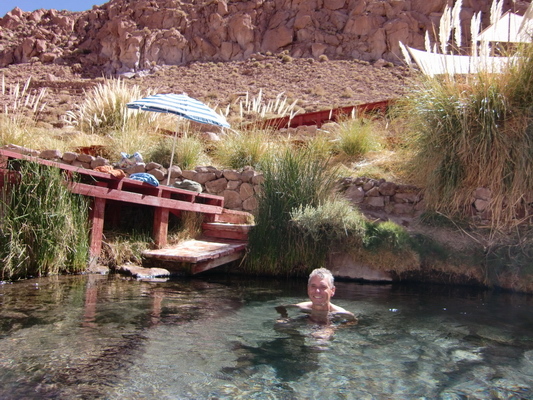 San Pedro de Atacama is an oasis in the extreme dry Atacama Desert on foot of the Andes. 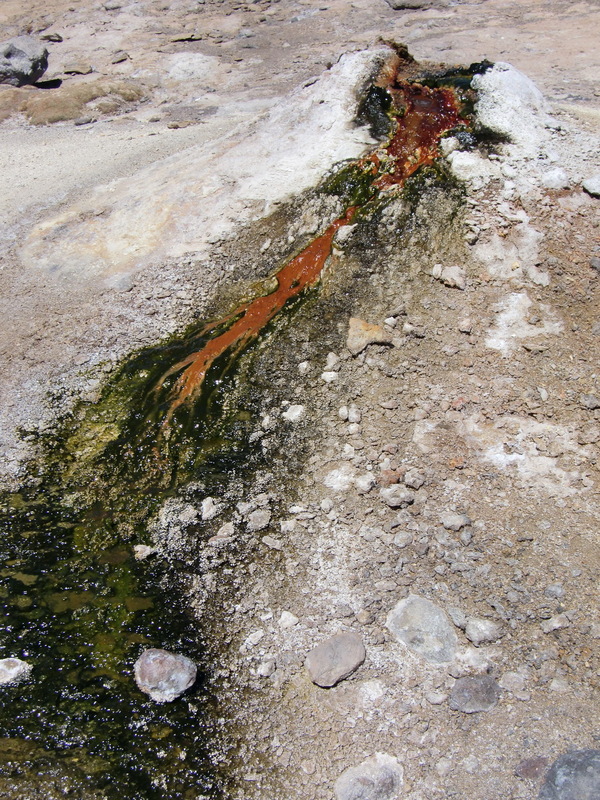 Its environment is very beautiful with salt lakes, hot springs, gorges, rocks and a lot of volcanoes. 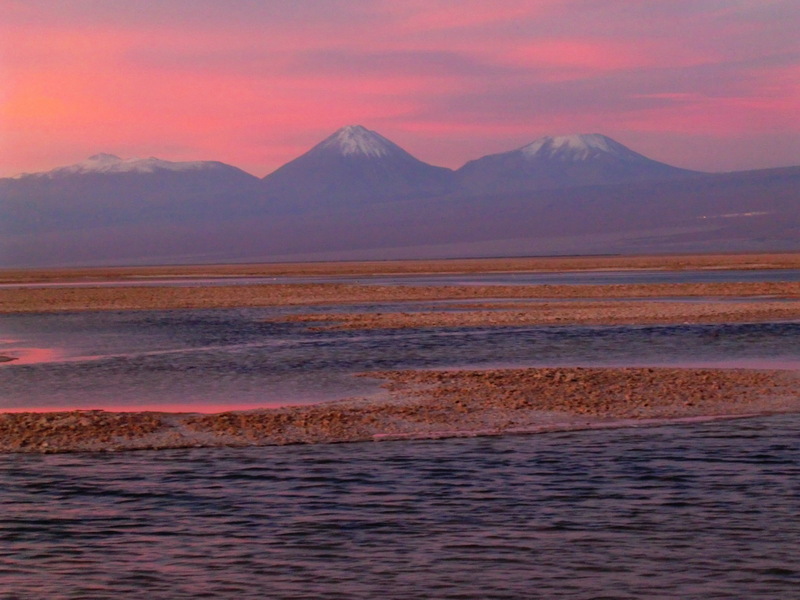 South of San Pedro is the Salar de Atacama, the third largest salt lake in the Andes. 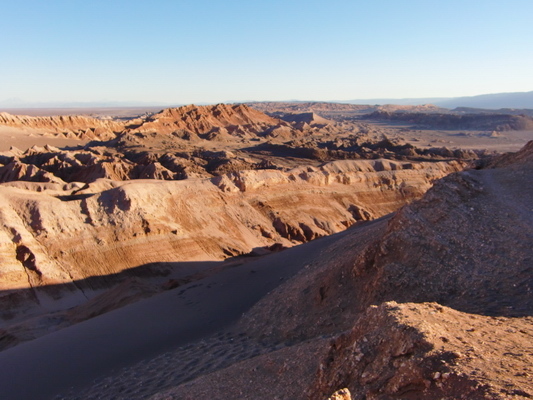 West of San Pedro is the Valle de la Luna, the moon valley, which gives an imagination of the landscape of the moon. San Pedro is the holiday destination in the north part of Chile. All facilities like excellent restaurants, souvenir shops and tour guides are available. And there are many tourists from nearly every part of the world. The climate of San Pedro is very pleasant, especially in autumn: Always sunny, up to 25°C in the afternoon, but closed to zero in the morning. San Pedro is already more than 2400 meters high. 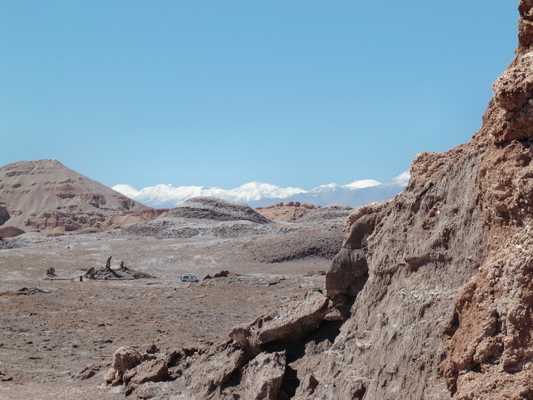 We started our trip to San Pedro de Atacama in the Valle de la Luna. This valley is part of the Cordillera de la Sal (salt mountains), which is between the bigger Andes and Cordillera Domeyko. 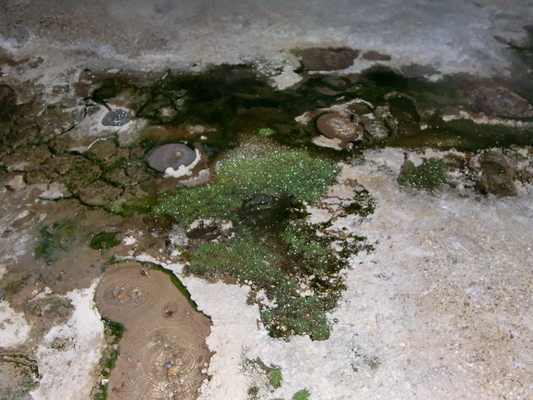 It is built up mainly by a mixture of salt, mud and sand. 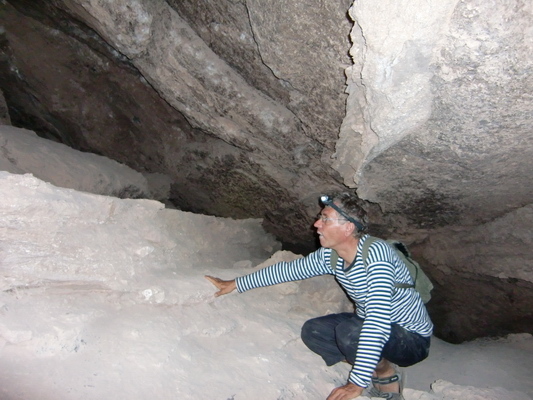 There are nice walks in the Valle de la Luna: One leads you into a gorge and former salt mine. 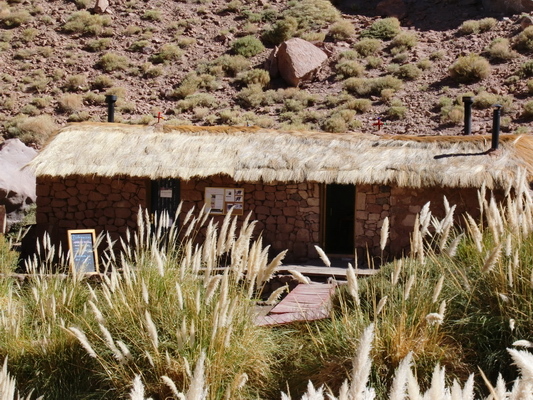 Others direct you to dunes or peaks of the Cordillera de la Sal, which is up to 2700 meters high. 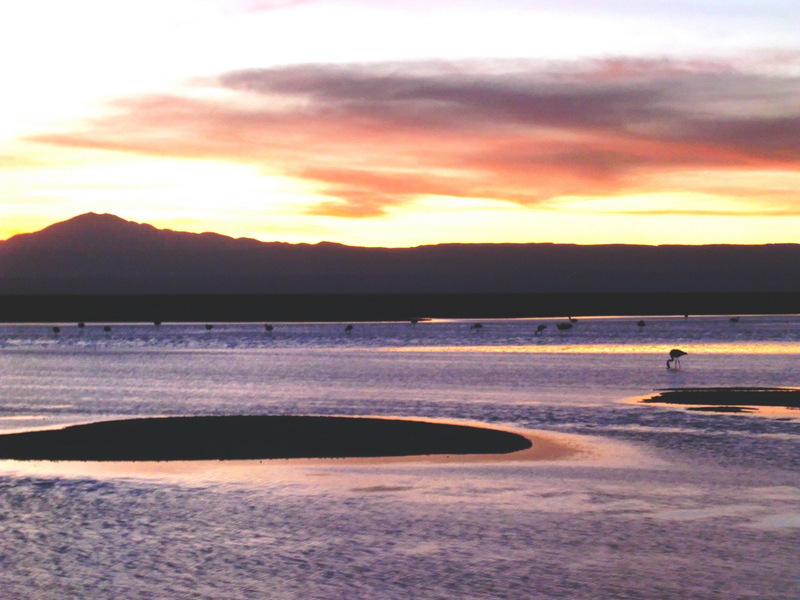 The Valley del la Luna is famous for its sunset and the glowing Andes. Hundreds of tourists are climbing up the peaks every late afternoon to enjoy this view. 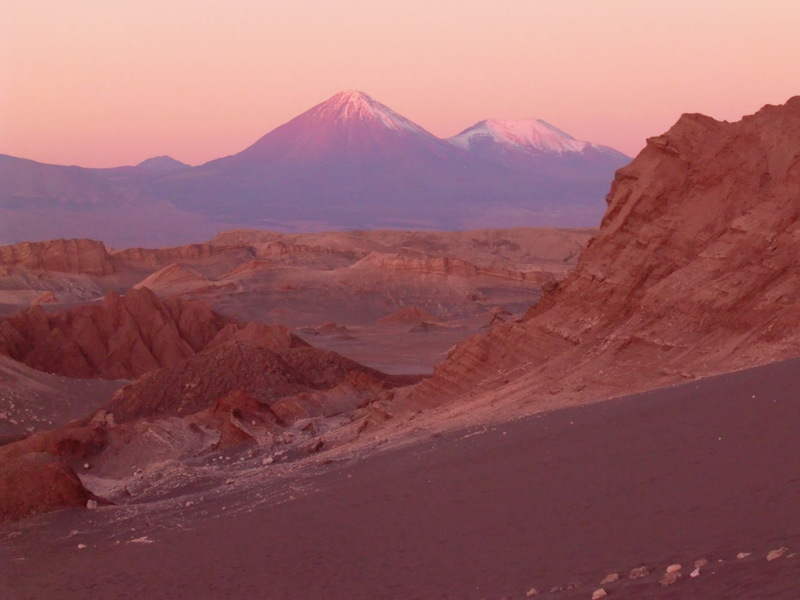 Very spectacular is the volcano Licancabur with its perfect cone shape. 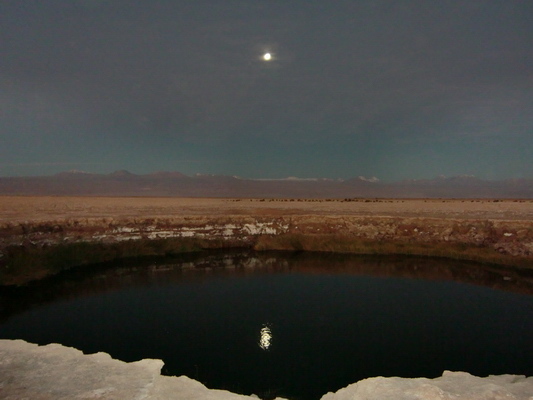 It is closed to 6000 meters high and the landmark of San Pedro de Atacama. 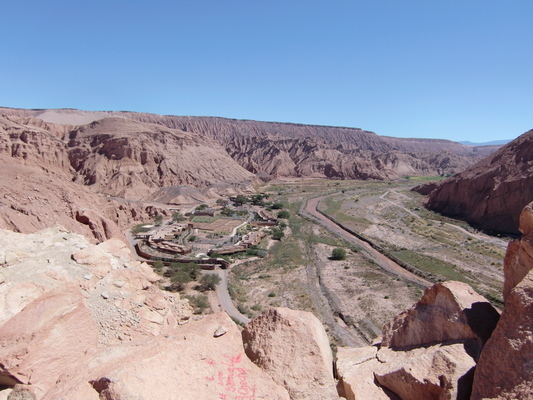 Another highlight of San Pedro de Atacama is Pukara de Quitor, a fortress built in the 12th century. This was the last hideaway of the Incas, when the Spaniards conquered South America. From the top of the fortress you have a wonderful view into the valley of the Rio San Pedro. After so much history we wanted some sport, maybe swimming. 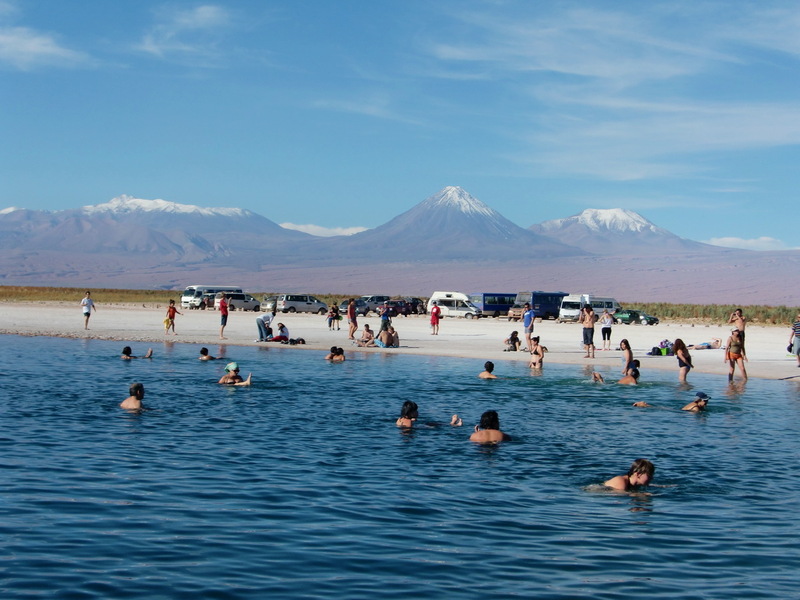 Indeed there are the Lagunas Cejas on the Salar de Atacama, where you can swim a little bit in one of its lake. Swimming is very funny there, because the water is so salty that you get an incredible uplift pressure. Consequently we were lying in the warm water and discussing a lot of stuff with a Chilean man who had lived in Germany. Fortunately we had sufficient fresh water in our car to remove the salt from our skins after our bath. There is a beautiful walk around the other lakes, mainly on salt. We drove further into the Salar de Atacama. 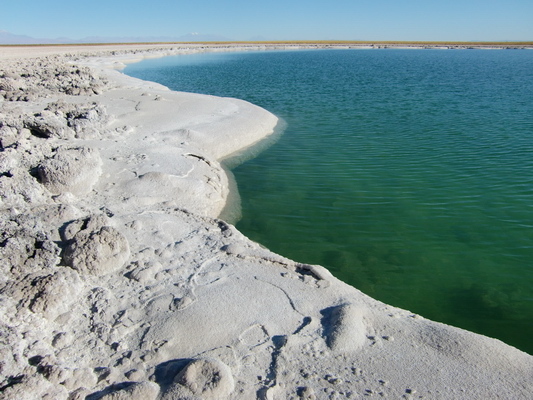 Next were the Ojos de Salar (eyes of the salt lake) with fresh water. 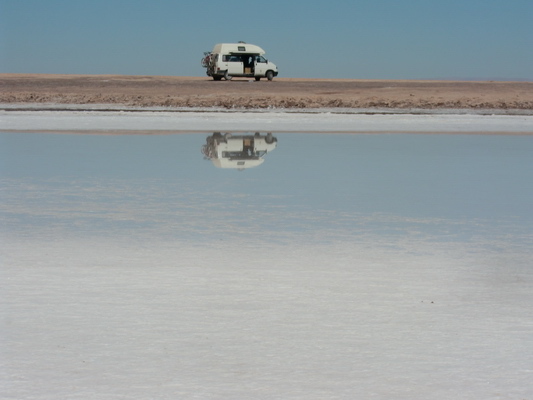 We stayed the night on Laguna Tebinquiche, which is totally white like a frozen lake with a little bit snow on it. But in this case it is salt! 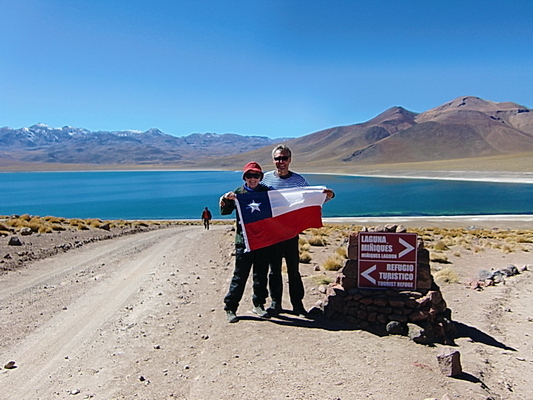 After visiting the Salar de Atacama, we felt strong enough for a higher mountain. We decided to climb up smoking Volcano Lascar, see extra article. 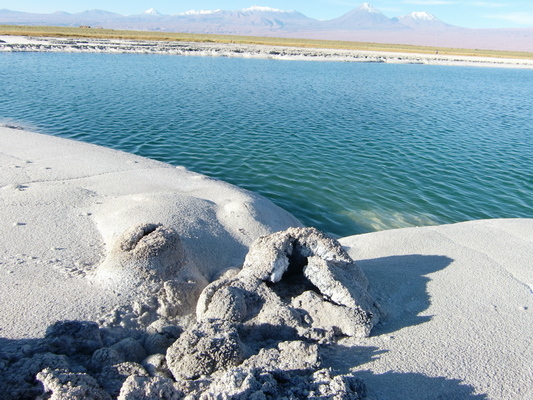 South of Volcano Lascar are the wonderful Lagunas Miscanti and Miniques. The color of their water is incredible dark blue. They are quite high, more than 4200 meters sea level. Not appropriate for swimming, but for picnic. On the way back to San Pedro de Atacama we passed a nice gorge with fluent water. There is an aqueduct to the nice village of Socaire, where some basic agriculture is possible - thanks to the water. In Socaire we got a delicious lunch with soup and main course for an incredible low price. 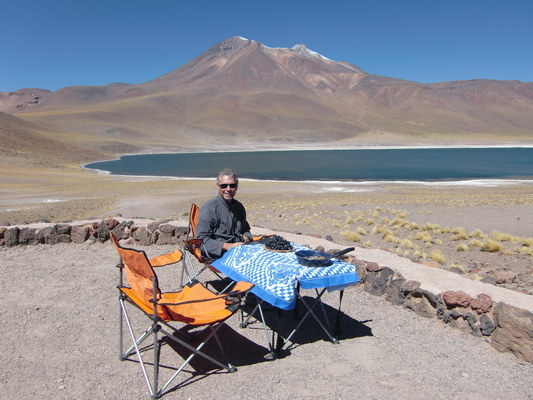 After a rest we drove again to huge Salar de Atacama, to Laguna de Chaxa. 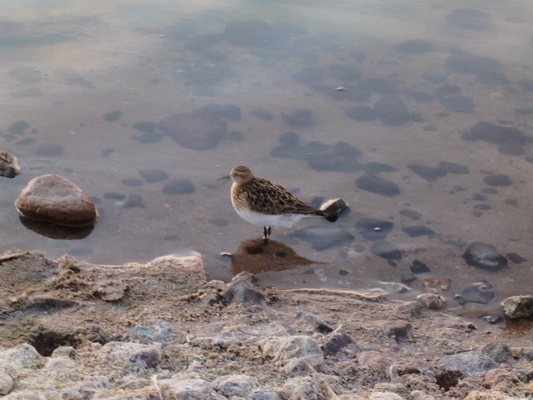 This lake is famous for its birds. We arrived there few minutes before sunset and had a fantastic view to the mountains. 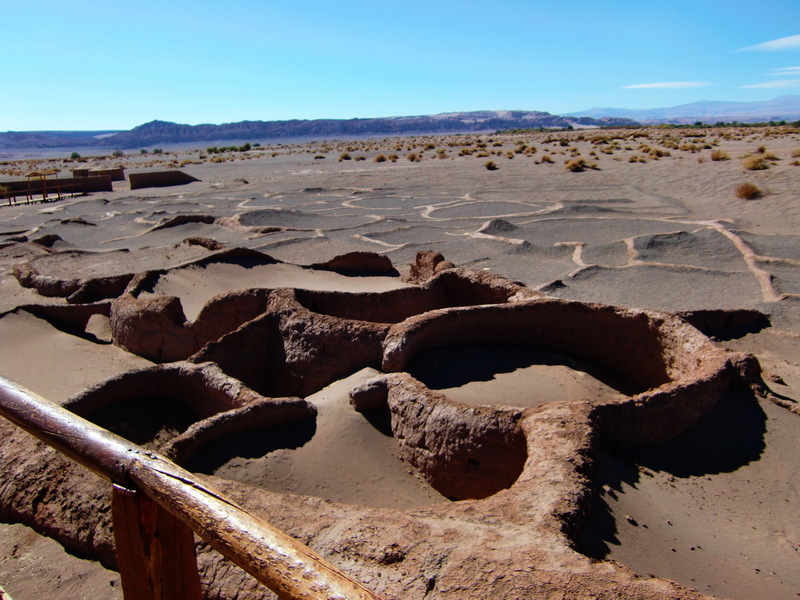 We stayed some days in San Pedro de Atacama to aquire food, check Internet and to visit Parque Arqueologico de Tulor. 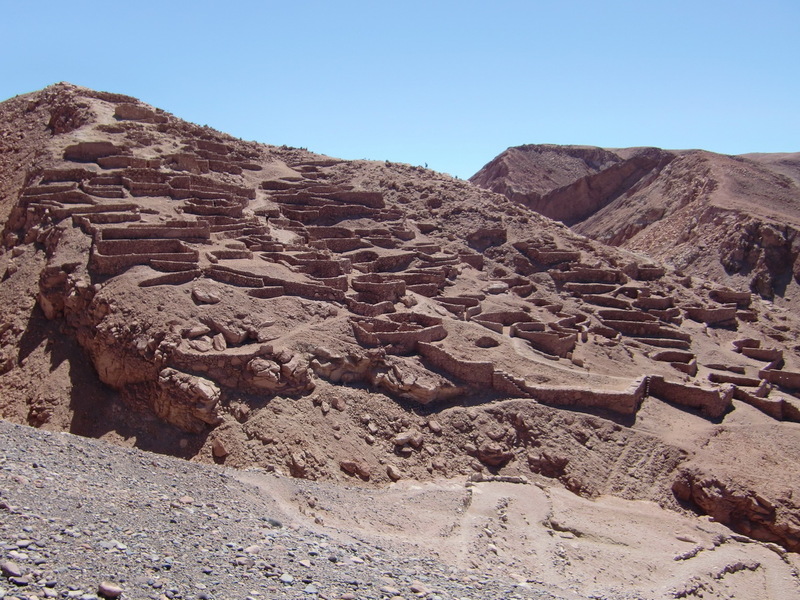 There are the oldest ruins in the area of San Pedro de Atacama: They were built between 800BC and 500AD. Just 10% are explored and unearthed - still a lot to do for archeologists. Our next destination was the Banos (baths) of Puritama, approximately 30km north of San Pedro. 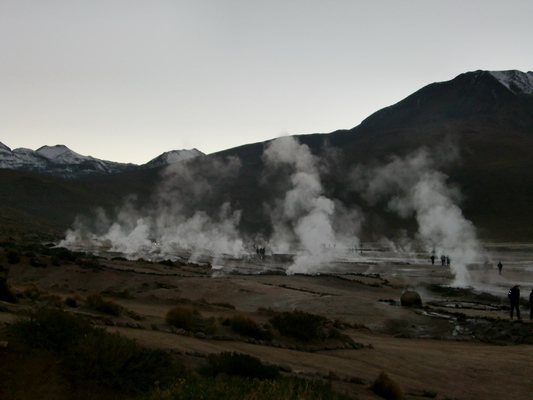 They are on the street to the Geysers de Tatio, a must to visit in San Pedro de Atacama. It is such a beautiful place that we stayed nearly one full day there. The temperature of the water is pleasant, approximately 35°C. 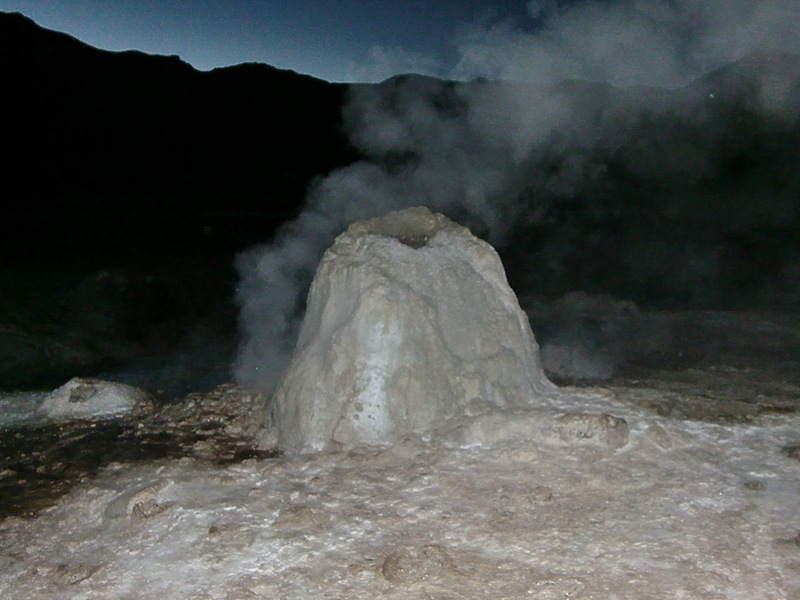 In the evening of April 26th we drove with our car the road to the Geysers of Tatio. The road became worse and worse, like corrugated sheet iron with deep waves. Suddenly our brakes did not work. Checking the car we saw a lot of oil soaking out of both, the rear shock absorbers. Now we knew, why we had felt in our car like on a ship in a heavy storm. Fortunately there was no leakage of the liquid for the brakes. 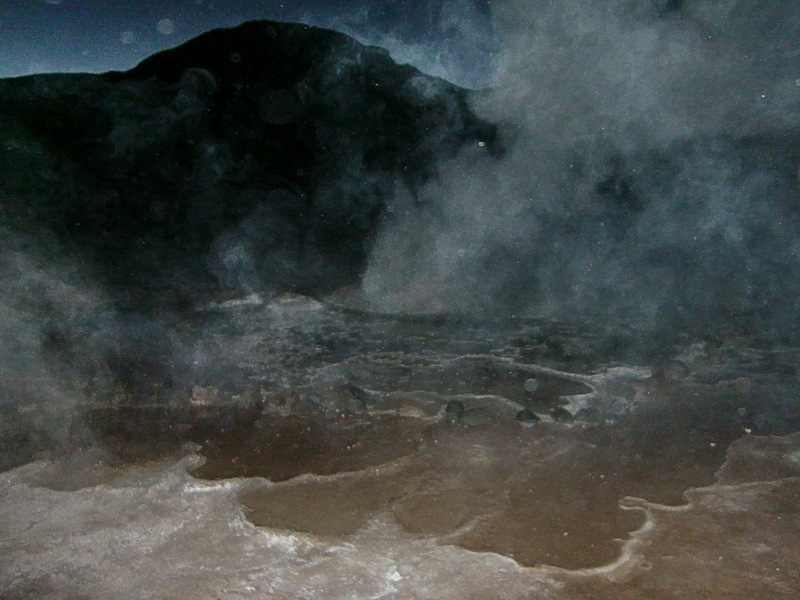 Consequently we assumed that some gas bubbles are in the liquid due to the enormous altitude of more than 4000 meters. The possibility of air bubbles were also described in our Volkswagen maintenance and repair book. The brake should work again after the second or third push. We tried more pushes and indeed it worked again. So we drove slowly, very slowly (less than 20km / hour) the remaining 15 kilometers to the entrance of the Geysirs. Fortunately there was no big slope down. But we had the feeling that we need a tow truck to piggyback our car to come down on the next day. 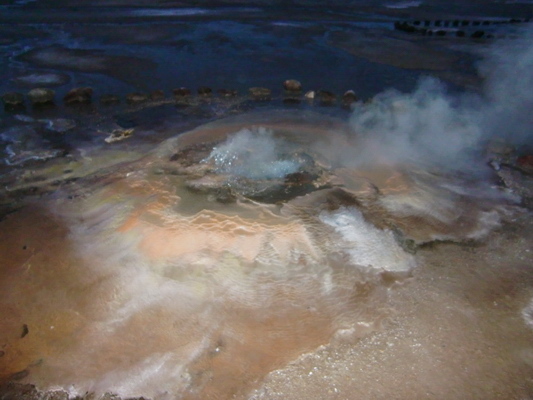 The Geysers are very active in the early morning due to big temperature differences of the air (below zero °C) and the hot water. Their activity declines in the forenoon. Consequently we drove with our bicycles the remaining two kilometers very early in the darkness of the next day. It was very cold, for sure less than -10°C. 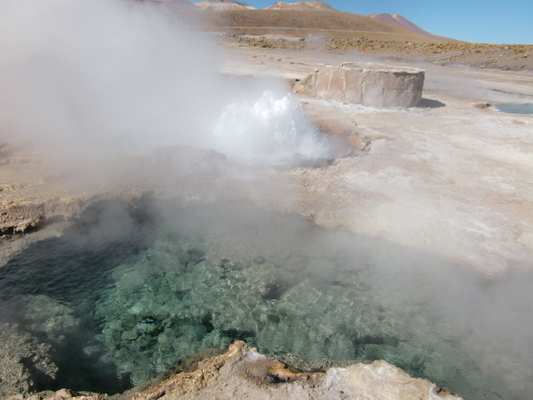 The Geysers de Tatio are one of the highest of the world, more than 4400 meters over sea level. But it was an incredible experience. Of course there were many other tourists to see this spectacle. Most of them had started at 4:00AM in San Pedro de Atacama to arrive in time. Everybody was jittering due to the severe cold and yearning for the sun. After sunrise we returned to our car to warm up and to take the breakfast. We were hungry like wolves and the gas heating of our car worked perfectly. We discussed the mess with our car with several people. They advised us to drive very slowly to Calama, because the street to Calama is in a much better condition than the road to San Pedro de Atacama. 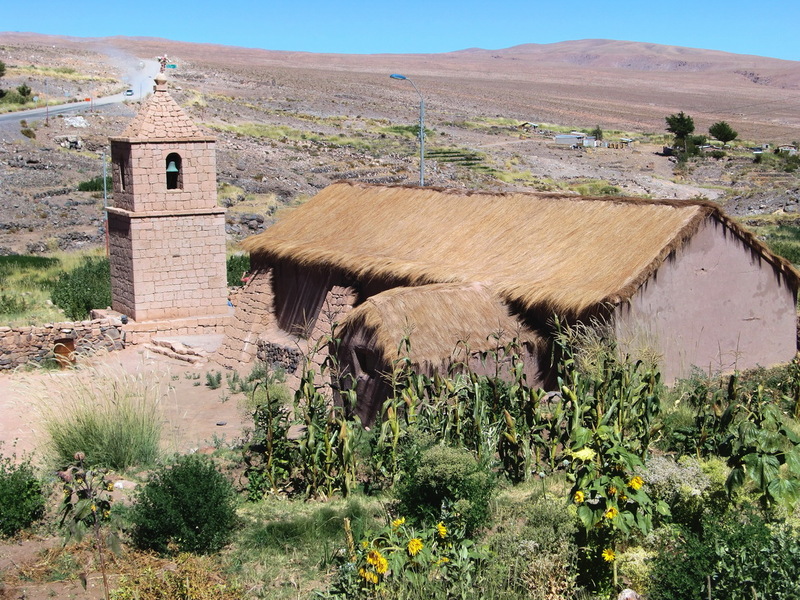 Besides that Calama is the main town in this region with more than 150,000 inhabitants. There we should find some help and new shock absorbers. But it was more than 150 kilometers to Calama with a speed of maximal 20 kilometers per hour! 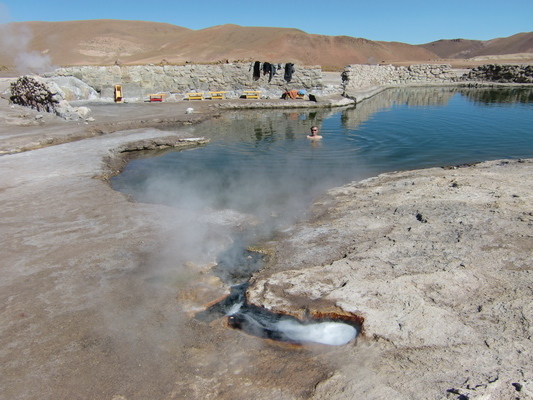 We decided to split the journey to Calama in two days and to return to the Geysers, because there is a nice pool with warm water. Most of the other tourists had disappeared already and the sun was shining intensively. Indeed the street to Calama was relatively good. Our brakes worked perfectly when we came down the less than 3500 meters. Over this level we had to push several times, but somehow they functioned. Our hope was to find a Volkswagen service in Calama, but we did not find any. We asked at a gas station for another good service. The owner checked immediately the Internet and confirmed that there is no Volkswagen workshop in Calama. The gas station had also some small facilities for checking the car or changing the oil. He phoned a lot and few minutes later a small van came with two technicians. They dismounted the right rear shock absorber and drove with Alfred to a street with many car spare part shops. But Volkswagen is not very popular in Chile, so the first, second, third ... had not an adequate shock absorber for our car. Finally the sixth had some with more or less fitting sockets. It meant that one side was much thinner than the original one. No problem we use washers, was the comment of one of the technicians. We had to use six washers for every side. In additions this shock absorber looked much daintier than the broken ones. But we had no other choice. Back to our car the new shock absorber was soon assembled on the rear right side. But dismounting the broken one on the rear left side became a serious problem. Both technicians worked few hours until it became dark. But the corrosion of the upper fixation was so hefty that they could not move the screw even with very heavy tools for trucks. The next day we drove to another workshop outside of the city. There the two technicians had asked a welding specialist to come to solve the problem. He worked more than one hour to melt the screw! We were happy to have new rear shock absorbers and went to a tire shop to change the front tires, which worked without any implications. Finally we asked for a possibility to check our brakes. Fortunately there was a specialist just on the other side of the street. It was already Friday at 5:30PM, so we were afraid that we had to wait till next Monday. We asked the guy to check our brakes and remove the gas in the brake liquid. Instead he completely dismounted all four brakes. We got serious doubts that he is able to assemble them properly again, because a lot of screws, springs and other parts were on the floor. There were some deep grooves and scratches in the brake pads and drums. He ground the pads manually and the drums with a lathe. Finally he assembled all four brakes perfectly, closed to 8:30PM. We paid an unbelievable low price for this Friday evening service. The brakes were working properly, but the new shock absorbers were too weak. In our car the swings were still like on the ocean in strong winds. We decided to drive to Salta in Argentina, because Volkswagen is very popular in Argentina. The best way to Argentina is the Paso de Jama to Argentina, which is fully tarred. And there is Volcan Licancabur closed to the street to the Paso de Jama, one of the pretties' cones of the world (see above and article Volcan Licancabur and Cerro Incahuasi).